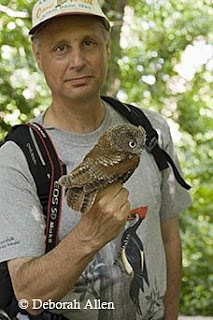 A decade ago when biologist Robert DeCandido, PhD wanted to reintroduced Eastern Screech Owls to Central Park, birders argued over whether they would face a grim death or be so successful they’d devour all the songbirds. Fast forward 11 years and now the tiny owls have quietly established a population up in the North Woods. So that when wildlife rehabber (and fireman) Bobby Horvath released five screech owls Saturday, everyone had come around to welcoming the three gray juveniles and two reds (one adult and one juvenile). Local bloggers like Gothamist and fantastic wildlife photographer Bruce Yolton’s Urban Hawks were just thrilled. DeCandido, better known as Birding Bob, says he saw the two youngest owls hanging out together on Sunday. None of the birds were related and they were of different ages, but he would still expect to see some sticking together, at least for a while. Yolton says that the owls at least won’t face the threat of great-horned owls that live on Long Island. DeCandido points out that there aren’t too many competitors of the same species in the park–and that now the army of wildlife photographers will be able to track them. Still, he says, most aren’t going to make it. People always underestimate how few animals surivive in the wild. The mortality rate for Eastern Screech Owls raised by their parents is 80%. And it’s even worse for those raised by humans and released in the park: 89%. So, that’s why DeCandido wants to release as many as possible. In 2002, when he still worked for the parks department, he released 33. You never know which will succeed and breed. One red-phased (that is, red-colored) one released last fall by Horvath already mated. The young ones are also a bit surprised by all the songbirds mobbing them, he says. They should just sit still, back against a trunk. Instead they get spooked and fly–making more of a commotion and easier for the other birds to knock them down. But, they’re learning.